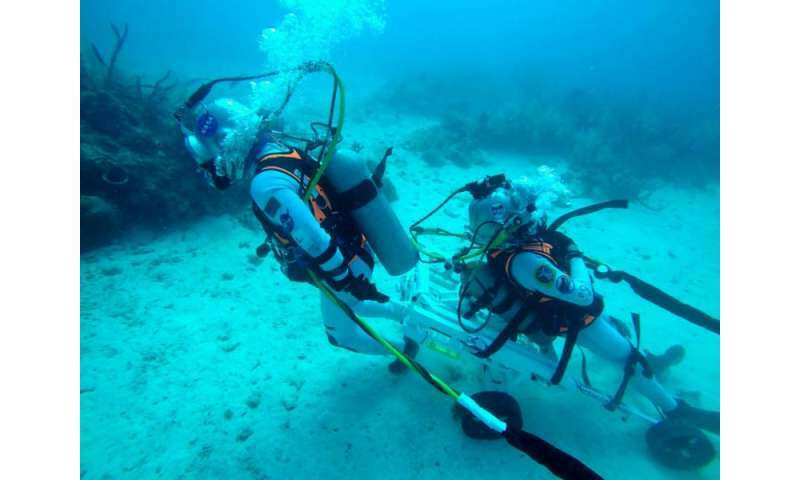 During a simulated space mission underwater last week, ESA tested an ingenious concept to bring astronauts safely back to base if they are incapacitated during lunar exploration. 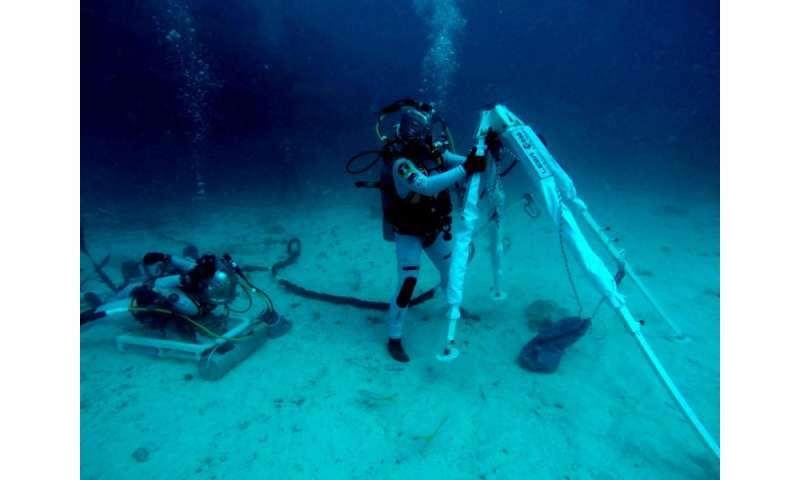 Four 'aquanauts', including ESA astronaut Pedro Duque and NASA astronaut Kjell Lindgren, took part in NASA's 22nd Extreme Environment Mission Operations (NEEMO-22) mission, spending 10 days in the Aquarius habitat 20 m underwater off the coast of the Florida Keys. The goal is to simulate aspects of space exploration to test new equipment, procedures and operations. The aquanauts made regular 'waterwalks' and, by adjusting their buoyancy, they simulated gravity levels found on the moon or Mars. With its sandy seabed and uneven rocky terrain, the ocean floor around Aquarius provides an ideal moon-like environment. Pedro explains: "The mission was both familiar and unique. Familiar because it resembled spaceflight – from the mission preparation, timelines, priorities, 'launch' when we dived to the base and daily programme meetings, but the environment was unique living and working at the bottom of the sea." ESA astronaut trainer Hervé Stevenin joined NEEMO-22 to test a new ESA device designed to help a stranded astronaut on the moon. Being able to rescue someone is an important part of any lunar excursion, but an astronaut would not be able to carry or drag a fallen colleague to safety because spacesuits are heavy and limit movement. The Lunar Evacuation System Assembly allows for quick recovery of a moonwalker while keeping the limited mobility of a spacesuit in mind. A foldable pyramid-like structure on wheels opens above the astronaut, it lifts the incapacitated figure using pulleys and places it on a wheeled stretcher. It took only six months to produce the device at ESA's astronaut centre in Cologne, Germany, from concept to the first prototype built by Dutch company HAL-3 Projects. Before its assessment at Aquarius, the device was tested in the centre's large training pool during simulated moonwalks. Pedro and Kjell took turns to be the fallen astronaut and coming to each other's aid. Hervé says, "We designed it with international cooperation in mind and based on our expertise in spacewalks and experience working with NASA on the preparation of future space exploration. "This lunar simulation capability will allow more tests of innovative European hardware for future human exploration of the moon." Based on the feedback from the latest trial, ESA will improve the hardware to make the moonwalk rescue even quicker and easier.